21.1% recycled content of all materials in the building. 91% diversion of construction wastes away from landfills. Real Time Utility Display: A monitor in the lobby shows tenants how much energy and water they are using, in real-time! Water Consumption: Efficient showers and sinks reduce water use by 32.7%. Natural Light: 20% of the wall area is glazing, all windows are energy efficient low-E, and double pane. Efficient water cooled chiller and central campus steam. 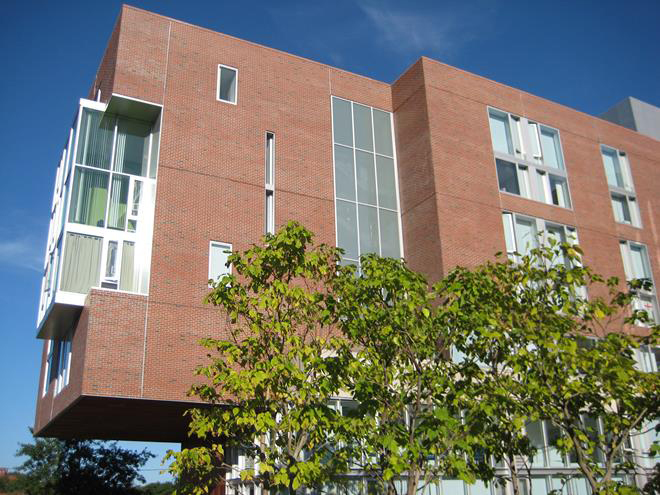 Completed in July, 2008, the 10 Akron Street residence hall provides the Harvard campus with new graduate student housing. Situated along the Charles River in Cambridge, this seven story building includes 151 living units and three additional levels of below-grade parking. Total size of the building is 106,569 square feet. The property is an easy walking distance to both Harvard and Central Squares, with shops, restaurants, and subway stations. Committed to sustainability measures, Harvard Real Estate Services and the design team used LEED for New Construction, version 2.2, to guide and certify green design elements in the project. Gold certification was achieved by the U.S Green Building Council in March 2009.